Time for monthly poetry group. each month I try in an endless loop. Does that make me a nincompoop? 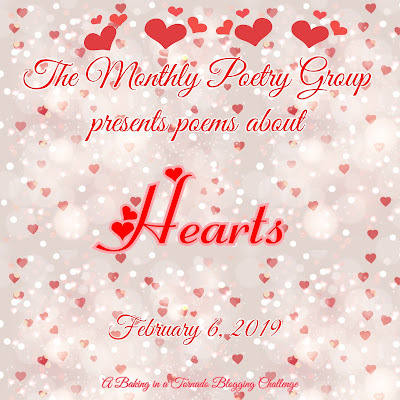 Hearts were chosen as this month's theme. I present my poem, try not to scream . . .
no, don't roll your eyes. Joey did, he's now more wise. one that the judge sequesters. being present in your life. That is all that I have planned,"
he'd lovingly told his wife. Valentine's Day with his honey. no cards mailed nor flowers sent. Expressions have been money well spent. gestures no longer felt fake. Why, he even learned to bake. Dawn of Cognitive Script shares My Heart My Gift. 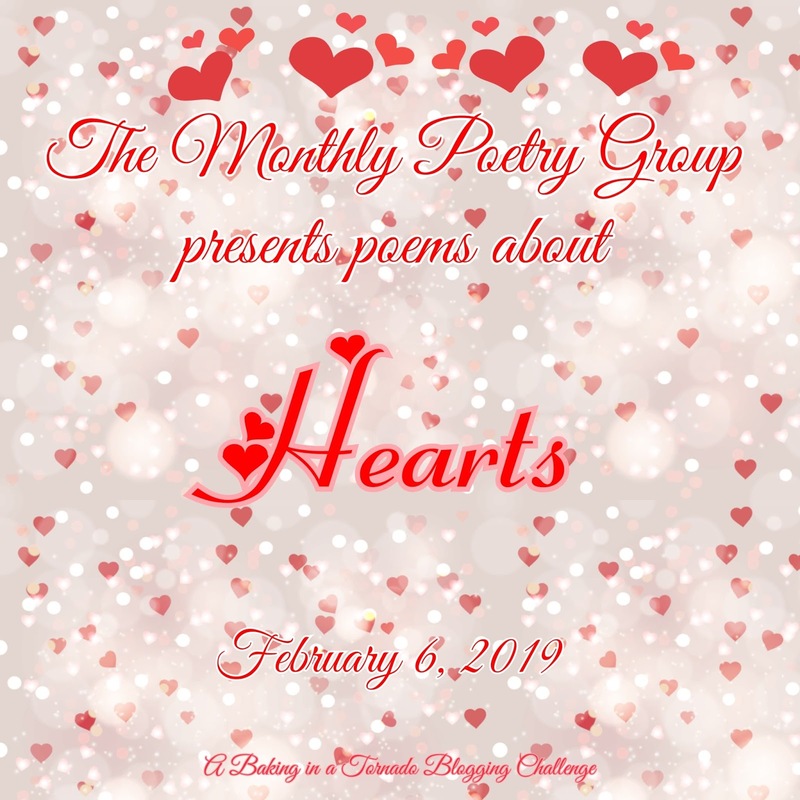 Jules of The Bergham Chronicles shares Hearts Heal. Lydia of Cluttered Genius shares 6 Hearts. Diane of On the Border shares My Hearts. *Preheat oven to 350 degrees. Grease and flour a bundt cake pan. *Prepare the cake batter according to the directions but in place of 1/4 cup of the water, use 1/4 cup cinnamon liqueur and add 1 tsp cinnamon. Once prepared, fold in 2 TBSP red colored sugar. Pour into prepared bundt pan. *Bake according to package directions, approximately 34 minutes, just until the center springs back to the touch. Cool in the bundt pan for 10 minutes. *Run a knife around the cake, then invert onto a serving plate. Cool completely. *Whisk the powdered sugar with the remaining cinnamon liqueur. Add water, 1 TBSP at a time, until the topping reaches a drizzling consistency. Drizzle onto the cooled cake. Sprinkle Red Hot candies over the top for decoration. ooh that cake looks yummy! Joey saw the light!! Good for him. Yes, Joey did a great job baking, LOL! Haha...very cute. And the recipe looks terrific! Adotable! Way to go Joey! Lessons very well learned! At least he was willing to learn it! AND he learned how to bake! You can always share with the neighbors. I have a sensitivity (not quite an allergy) to cinnamon, but I would still be tempted to try this cake - without the glaze (don't ask but I don't like cake glaze - never had) or the red hots. That, I fear, would create cinnamon overload. Funny, some of us in my house love the red hots, others take them off. They aren't in the cake though so it's easy just to remove them if they're not your thing. I always love your poetry. This cake looks amazing!!! !